This “What To Do When Your Toddler Refuses To Potty Train With Signature Care Diapers” post is sponsored by Signature Care Diapers. As always, all opinions are my own. Our oldest son will be 4 in September and he still isn’t potty trained. Luckily, he isn’t our first child, so I’ve done the whole potty training thing before. However, I will say it is frustrating. Do I wish he were potty trained? Sure. But it certainly isn’t the end of the world that he’s not. I know we’re not the first parents to have a toddler that isn’t interested in potty training. If you google potty training there are MILLIONS of articles related to potty training and all its difficulties. But I’m here to tell you that not all children are the same. They will not all be potty trained at the same age. They will not all take to it as easily and for some it is downright terrifying. So, don’t get hung up on it. 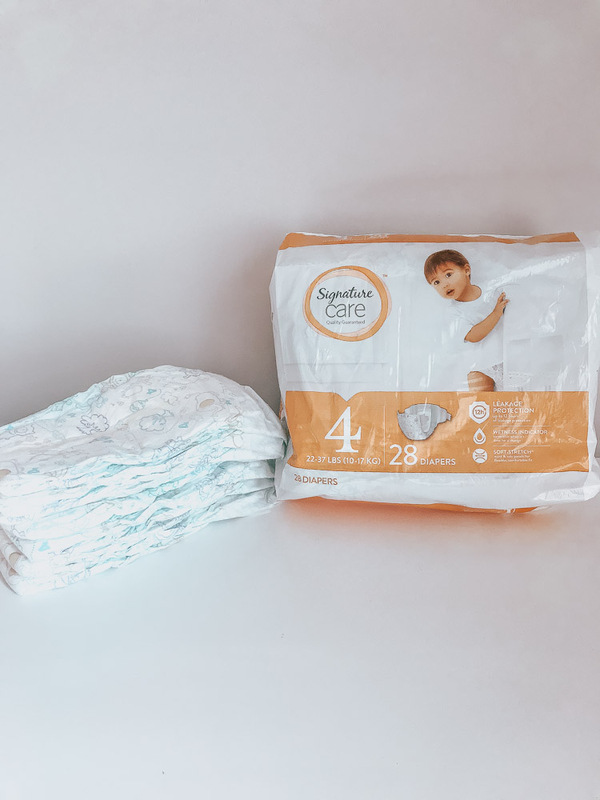 Today I’m going to share a few tips for what to do when your toddler refuses to potty train and why using Signature Care Diapers can help along the way. Be Patient – When it comes to potty training patience is truly a virtue. Just because you have one child that took to potty training in a day doesn’t mean that your next will be the same. (This is coming from experience!). The more patient you are, the less resistance you’ll likely receive. Give them more time – Is your toddler going to school/daycare soon? Why not wait until they go and see that some of the other kids are using the potty? This is what potty-trained our oldest! We never pushed the issue and when she went to school at 2.5 and saw the other kids using the potty she just decided to do it on her own! Use a quality diaper in the mean time – Not all kids will want to wear pull-ups. Our son doesn’t care if it’s a pull-up or a diaper he’s wearing – he will still go potty in it before he uses the toilet. 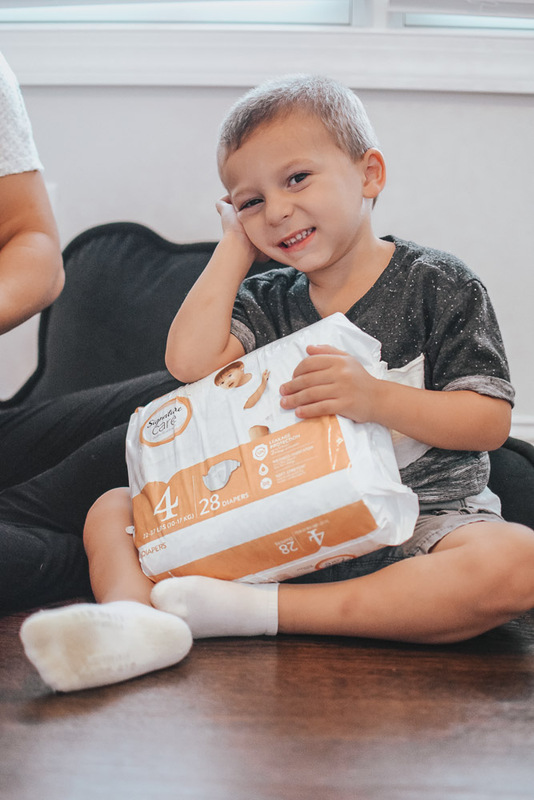 Just make sure the diapers you’re using are practical for a running, climbing, jumping toddler (if that’s your situation) such as Signature Care Diapers. They have a cotton-enhanced dryness layer which is essential for an energetic and busy toddler. 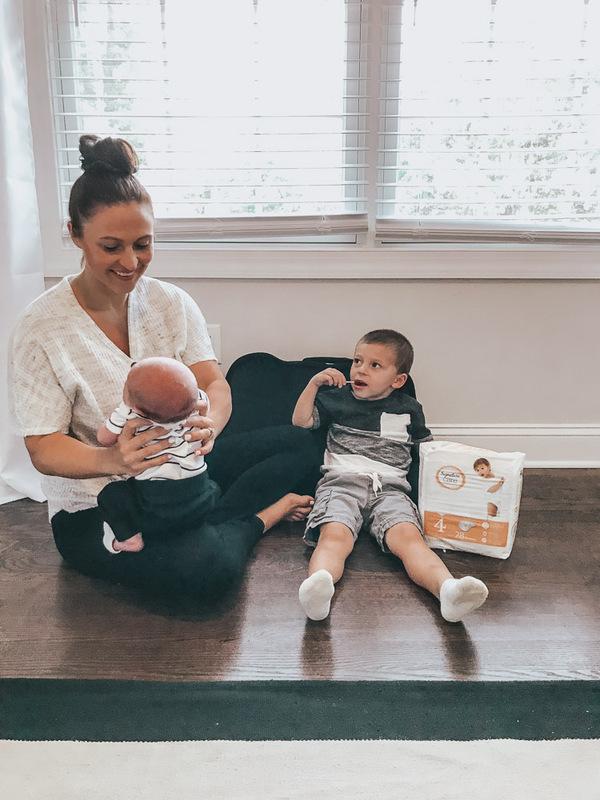 Our son is literally like a monkey – he never ever stops jumping and climbing, yet we haven’t have any issues with leakage from Signature Care Diapers. Find a diaper that won’t break the bank – I don’t think it’s a secret that diapers are expensive. And to be honest I think a lot of us parents prefer their kiddos get out of diapers ASAP to try to save some money. However, if your toddler refuses to potty train, pushing the issue isn’t the greatest idea. Instead, look for a diaper that provides quality AND value. Luckily, you don’t have to choose between the two these days. By choosing a brand like Signature Care Diapers you still get up to 12 hours of leakage protection and a wetness indicator. Plus, they offer significant savings compared to other national brands and even offer a 100% money back guarantee if you’re not satisfied. 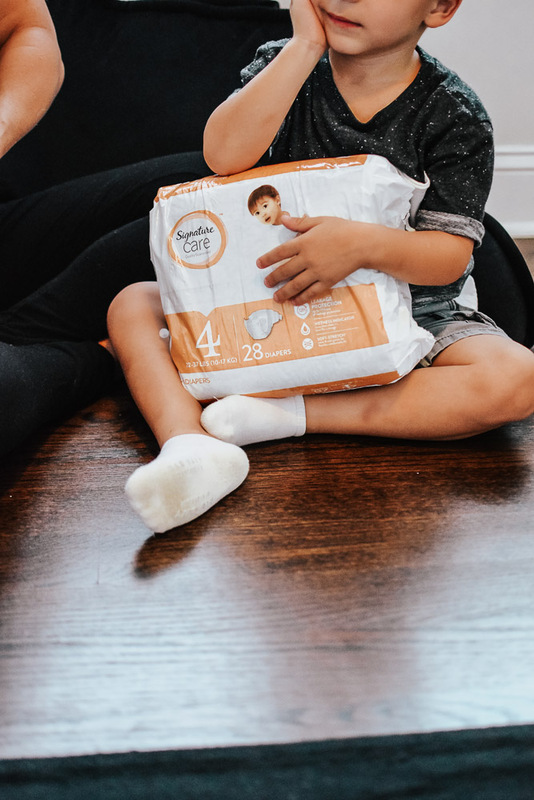 If your little one isn’t quite ready for potty training yet, Signature Care Diapers are still a great way to help save so much money. 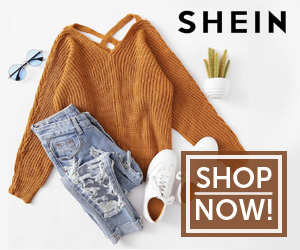 They provide the quality and comfort of leading national brands but without the hefty price-tag. Think about how much you could save if your babe still has a few years of diaper wearing days to go! to use on any Signature Care Diaper or Training Pant Product! Don’t stress – It might sound silly but stressing or making a big fuss over the issue will only make it worse. There is nothing wrong with having your toddler wear a diaper. Just remember to consistently ask if they have to go potty. Sometimes a diaper is just a comfort thing. Let them wear a diaper but repeatedly ask throughout the day if they need to go to the bathroom. They may start to realize on their own that they prefer going potty on their own vs. in their diaper. 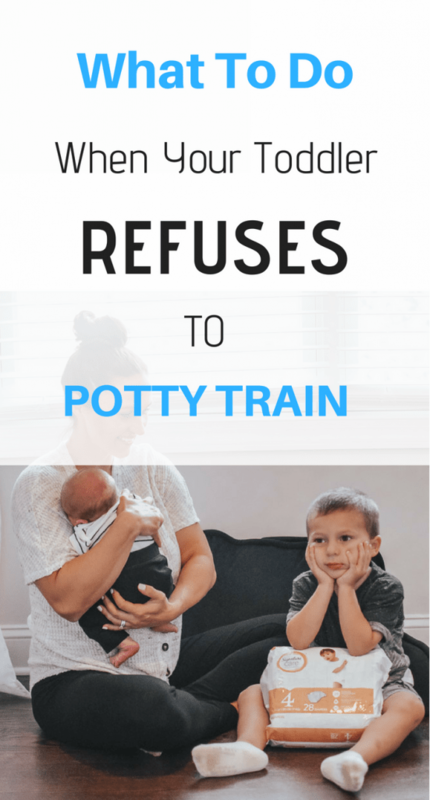 Do you have any tried and true tips for when your toddler refuses to potty train? Share this “What To Do When Your Toddler Refuses To Potty Train With Signature Care Diapers” post on Pinterest via the image below! Looking for more parenting posts? Check here. My middle child was way harder to potty train than my first. She also majorly regressed when her little sister was born so I stuck her back in trainers for a couple months because I was not about to deal with poopy undies and a newborn. Good luck! I hate potty training. Thank goodness for reliable diapers and good tips to help your child get comfortable using the bathroom! same lol. Our daughter was soooo easy, but not our son!!! I’ll have to check these out. My 2.5 year old is refusing to potty train. I had a totally different approach with my second child. I put less pressure on her and I and didn’t lose my mind as much! Patience is huge! Potty training can be a challenge for any parent but if you are patient with the process, you’ll want to rip your hair out a little less. 😉 Also, regressions happen at any age! My tip would have to be, no matter what age you decide to potty train your toddler, you’ve got to make the decision for good! Don’t be discouraged by accidents or regressions. Keep powering through with the training and it will get a lot better. I definitely agree with you! It can be so hard being patient but… it will all work out in time.